Events of this account occurred in Mason Co., in 1875. 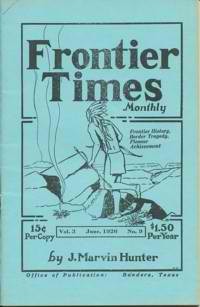 This is excellent history of the area and a great account of the Indian pursuits that followed a raid upon the ranch of early Mason, co. settler and prominent citizen, John Gamel. Those involved in this important pursuit were Capt. D. W Roberts, Ranger Company D and the men picked to go with him were: Second Sergt. Jim Hawkins, Privates Paul Durham, Nick Donnelly, Tom Gillespie, Mike Lynch, Andy Wilson, Henry Maltmore, Jim Trout, William Kimbrough, Silas B. Crump, Ed Seiker, Jim Day, John Cupps, and one other, the author of this account, Srgt. James B. Gillett. This account has many notable historical details of this part of Mason co. in 1870’s. Story has old photo of Sqt. J. B. Gill V Meeting F. H. Lehmann After Forty-nine Years. Lehmann had been captured by the Indians in Mason county some years before this fight and had became one of them. He had hidden in the grass while the rangers were hunting him, and after they had gave up the search and disappeared he had followed on the trail of the Indians until he rejoined them. 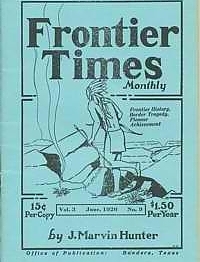 Further mentions: Honey Creek; the Frontier Hotel; Sergt. Plunk Murray; San Saba River near the mouth of Scalp Creek; the Big Saline; the headwaters of Bear creek; Kickapoo Springs; Tom Gillespie; Jim Day's Chico; Mike Lynch and Andy Wilson; Paul Durham; old Fort Clark, Texas; Wash Delong's ranch on the headwaters of the South Concho River; camp at Las Moras; M. M. Quaife; George W. Baylor; John Walker Baylor; old Fort Gibson in the Cherokee nation, now the State of Oklahoma; Major Jones, Captain Coldwell; Captain Roberts, and Lieutenant Reynolds; Sergeant Swilling; John Thomas; Captain Garcia; Don Ramon Arranda; Apache Chief Vietorio; General Terrazas; Tres Castillo; 'Los Pinos Mountains; Eagle Mountains; Diablo Mountains; Fort Quitman. SELLER’S NOTE: THIS ACCOUNT ABOUNDS IN RICH GENEALOGY, EARLY SETTLERS AND NOTABLE HISTORICAL EVENTS THAT OCCURRED IN AND AROUND UVALDE COUNTY IN 1860’S AND 70’S. Joe T. McKinney. Author’s father was Felix Carroll McKinney. He was a native of South Carolina and the son of Archer McKinney and Mahaley Howard McKinney. His mother was Mary Pocahontas Cook McKinney, the daughter of Joseph T. Cook and Lucinda Bates Cook. Joe T. McKinney was born in the town of Falcon, Columbia County, Arkansas, June, 2 1858, and here recounts his experiences in the town of Uvalde, Uvalde co. where he settled in 1865 and lived in proximity to kin who had previously settled there. He goes on to relate many details of his life and events in the area, with numerous names and places mentioned – this is truly an exceptional first-hand account, rich in details. Further mentions: two brothers, Black and Bill Malone; grandfather, Joseph T. Cook; , E. A. Bates; Julius N. McKinney; Felix Bates; Mrs. Melvirda Baker of Hidalgo county, Texas; Mrs. Mary E. Blakeney; mother's uncle, Dave Cook & sons, Bob and Thalis; the Tortuga; John Bowles and Lark White; Thomas Cook; Thalis McKinney who married a Miss Kate Woods; The Woods family had lived on Turkey Creek for several 3 years, which is between Uvalde and Ft. Clark; Doke Bowles' grocery; Margaret Bennett; Aunt Caroline McKinney. She was a widow who had lost her husband, Uncle Thomas, in the Civil War; Grandma Cook's brother, Levi Bates; Hamilton Bennett, a' widower with several children; Alex, Claude, High, and Bill; E. A. (Anderson) Bates; James W. Cook; John Pulliam and Tom Evan; H. W. ("Zude") Pulliam; George Evans; Pulliam lived at Bowie, 24 miles east of Willcox; the Cox settlement on the Nueces; Miles Cantrell; Old Josh Cox; Thorp Springs; Randolph Clark; Prof. John W. Mahan; Coryell county; Anderson Bates & a farm where Batesville, Zavala county, now stands; cousin, Rufus M. McKinney who had a ranch and cattle on Clear Fork, about fifteen miles above old Fort Phantom Hill and just bellow the mouth of Bitter Creek; Bull Head; Paint Rock on the head of the Llano; Scabtown was on the north bank of the river and on the opposite side from Fort McKavett; Kickapoo Springs, Lipan Springs, Ft. Concho, old Ft. Chadbourne; Nick Eaton, Buford and Will Carputter; Mr. Ferguson, whose brand was C5 on the neck and 61 on the shoulder; Orren Baker; John Pope, foreman, Nick Eaton; Jess Benton of St. David; Z. C. Prina; what is called the "Shinnery", on the north side of the Clear Fork. Mentions: T. F. Harwood of Gonzales; Dr. W. S. Red of Austin; Col. A. J. Houston of Pasadena; Dr. Alex Dienst, Temple, vice president; Judge George W, Tyler, Belton, vice president; Dr. E. C. Baker, Austin, recording secretary, and Dr. Charles W. Ramsdell, Austin; J. Frank Dobie; James K. Greer; Samuel E. Ashbury; Herbert Davenport; General George W. Morgan; Mrs. Mattie Austin Hatcher and Miss Winnie Allen; Dr. Robert Peebles; Mrs. Jane Long; Mrs. S. G. White of Hempstead. Mentions: Prof. Gates Thomas of Southwest Texas State Teachers college, San Marcos; Miss Adina de Zavala and Col. M. L. Crimmins of 'San Antonio and Mrs. A. B, Looscan of Houston; Victor J. Smith of Alpine, Dr. L. W. Payne of Austin and Miss Julia Estill of Fredericksburg; Miss Fannie Ratchford; J. Frank Dobie; John Lee Brooks of Southern Methodist university of Dallas; Prof. R. C. Harrison; Miss Louise von Blittersdorf of Austin; G. T. Bludworth of the state department of education related "The Legend of Caddo Lake; Henry Yelvington of Three Rivers; Paul Mongan; Dean T. U. Taylor; G. A. Cunningham, Sam Sparks; John Creighton, Mrs. J. A. Jackson, Mrs. Lydia Lea, Mrs. A. C. Wright and Miss Eula Peyton. This is an authoritative account of the reknown TX badman whose skill as a gunslinger is perhaps unsurpassed by all the badmen of the frontier. The information in this article has been culled from various sources, the Galveston News, the Austin Statesman, weekly papers of 1875, quotations from Giddings Tribune, individual acquaintances of Bill Longley, state records in the office of the Secretary of State and in the State Library, and many personal friends of the writer. KILLING OF THE YANKEE SOLDIER IN LEAVENWORTII. LONGLEY'S CAPTURE IN EDWARD'S COUNTY. THE KILLING OF LEW SAWYER ON THE DRY FRIO. A DAUGHTER'S ACCOUNT OF THE KILLING OFT HER FATHER. A. Huffmeyer. This fearsome event occurred on the evening of May 19th 1868 in the San Antonio and surrounding area. Hailstones weighed from one fourth pound to over two pounds each. It started northwest of the city about Helotes, and took in a stretch of country four or five miles wide, and spent its force about three miles below the city. There was absolutely nothing left in its wake. Fields of corn, waisthigh, were cut down, and all of the fruit trees were trimmed of leaves and fruit, and the beautiful gardens were beaten into the ground. Thousands of chickens, turkeys, and birds were killed, dogs, calves, sheep and goats were also killed, and there wasn't a roof, door or window left on the north side of the buildings. Further mentions: St. Mary's College; Ed Steves, the father of the present owner of the Stevens lumber yards; Also mentions a couple of other notable hailstorm in the region. Col. Martin L. Crimmins. This story chronicles the time that Robert E. Lee spent in Texas, including numerous accounts of his correspondence to wife and relatives in Virginia and his feelings about the place and people. Related by A. M. Nichols to S. C. Butler. The following unusually interesting account of a happening in Kenedy, Karnes County, Bee county, Goliad and Atascosa Co in March 1875. It was then that a man by the name of Frank Fountain and about thirty cowboys, came in quietly on San Antonio river and Escondido creek. The men spread out, fanlike, up the creek. and drove out all the cattle that could be found within that radius. By daybreak the next morning they came together a few miles above where the town of Kenedy is now located. The rustlers had herded together a bunch of cattle to the number of some 9000 head, and which they proceeded to drive on west. When the true owners of the cattle arrived, they determined to cut their cows from the herd. The account goes on to describe what happens next and subsequent events. Good history of the area including many names and early ranch info. Excellent account of this master Texas Historian and his work. "Thirty-one mule loads of silver it was, and they buried it there by a live-oak tree-" But did they? Four hundred years ago English grandmothers whispered many stories of Robin Hood, but they whispered no stranger or more numerous tales than are told today of buried treasure in Texas. It takes Professor J. Frank Dobie, secretary of the Texas Folk-lore society and English instructor in the University of Texas, who has dug on many a hill for buried treasure and traveled thousands of miles to gather new legends, to tell the story right. From the palm trees along the Rio Grande to the bleak prairies of the Panhandle, there are doubloons and Spanish gold, silver bars and lost mines, and if you'll dig in a certain hill where a certain tree leans to the east-so the people say. But "In one Texas town there is more color of legend and history than can be found in the whole state of Iowa," Professor Dobie, who has had as many exciting experiences as perhaps characterized Coronado's expedition to America during the years he has spent gathering legends, said. "The southwest, particularly rich in such material because of its Spanish background, literally abounds in lost mines and buried treasures if legends could be relied upon as facts..."
Account of Mrs Mary A. (Glasscock) Anderson surviving widow of noble Texas veteran, Mr. Washington Anderson Austin. Account details her travels to Texas with her parents siblings and number of slaves after a troublous 8-day voyage which finally ended on the gulf when they landed at the mouth of the Brazos River in 1835. Further describes settling in Williamson county where they established a grist and sawmill on Brushy Creek, in the vicinity of Round Rock. Colonel M. L. Crimmins. In 1884 the Tonkawe were moved to the Oakland Reserve, in the northern part of Indian Territory. In 1890 they consisted of a conglomerate of tribal remnants, who varied considerably in size, conformation and even in language, and only one of the thirteen totemic gentes were known as "genuine Tonkawes." They only had 78 members at that time. The Tonkawes were anthropiephagists in the early days, but they usually ate prisoners of war of other tribes, expecting by so doing to deprive the dead of the possibility of living a second life and taking revenge. They state that human flesh tastes like bear meat. Account of Colonel Thomas Jefferson Shannon, who prairieschoonered his way into the vast and howling wilderness in the days of headrights and the buffalo. He is largely remembered by the old timers of the State as the man who introduced the Red Durham strain into the cattle business of the West if not the entire country. The Red Durham strain is the breed immortalized in our era by the well known Bull Durham advertisements. It gradually replaced the standard Texas longhorn and fortunes were made by the ranchmen who bred it. Prince Albert; Winnie Allen; Mary A. Anderson; Washington Anderson; Wilson Anderson; John Arden; Don Ramon Arranda; Samuel E. Ashbury; Bill Baker; Cullen M Baker. Cullen Baker; Dr E. C. Baker ; Melvirda Baker ; Orren Baker ; William Baker; Anderson Bates; Charley Bates; E. A. Bates; E. A. (Anderson) Bates; Ellen Bates; Felix Bates; Lee Bates; Levi Bates; Mary Bates; Meivinda Bates; Millard Bates; Robert Levi Bates; Tom Bates; W. A. Bates; Lt George W. Baylor; John Walker; Lt Walker; Alex Bennett; Bill Bennett; Claude Bennett; Hamilton Bennett; High Bennett; Margaret Bennett; Jess Benton; Ben Bickerstaff; Judge Bigelow; William Black; Mary E. Blakeney; Louise von Miss Blittersdorf; G. T. Bludsworth; Daniel Boone; Col Bowers; Doke Bowles; John Bowles; Brininstool; Dan Brister; Steve Brodie; John Lee Brooks; Henry J. Brown; Jim Brown; Sheriff Jim Brown; John Brown; Paul Bunyon; Pat Burk; W. M. Burroughs; William Burrows; P. B. Butler; S. C. Butler; Wm G. Butler; Caldwell; Sam Calvert; Miles Cantrell; Buford Carputter; Will Carputter; Capt Adna Chaffee; Father Chambodut; Queen Charlotte; J. M. Choate; John Claire; Dave Clark; Randolph Clark; Joseph Cluck; Wallace David Coburn; Gov Coke; Richard Coke; Coldwell; Capt Robert Coleman; Bob Cook; Dave Cook; James W. Cook; Joseph T. Cook; Joseph T. Cook Sr; Lucinda Bates Cook; Thalis Cook; Thomas Cook; Samuel Cooper; Juan N. Cortina; Arch Cox; Josh Cox; Manuel Coy; John Creighton; Col M. L. Crimmins; Col Martin L. Crimmins; Bettie Croft; Pvt Silas B. Crump; G. A. Cunningham; Pvt John Cupps; George Washington Parke Custis; Harbert Davenport; Gov Edmund J. Davis; Jim Day; Pvt Jim Day; Margry Decourvertes; Wash Delong; T. S. Dennis; Dr Alex Dienst; Pvt Nick Donnelly; E. M. Dubose; Bull Durham; Paul Durham; Pvt Paul Durham; Frank Eastwood; Nick Eaton; Capt Z. P. Egleston; Julia Estill; George Evans; Tom Evans; Dr Fields; Charles J. Finger; Sheriff Finley; King Fisher; King (See John King); Frank Fountain; Ben Franklin; Gen Gaines; John Gamel; Capt Garcia; Dr Gasley; Tom Gillespie; Pvt Tom Gillespie; Capt Gillett; Sgt J. B. Gillett; James B. Sgt; S. H. Gilliland; Will Grant; Green; James K. Greer; Maj Hardee; Hardin; George Harold; Benard de le Harpe; Wash Harris; R. C. Prof Harrison; T. F. Harwood; Mattie Austin Hatcher; Mrs Will C. Havens; Jim Hawkins; ; William E. Hawks; Clint Haworth; Maj Samuel P. Heintzleman; William Henry; Col A. J. Houston; ; Gov Hubbard; A. Huffmeyer; ; Mont Hurst; Bill Irvin; Lavinia Jacks; Mrs J. A. Jackson; Dr Johnson; Tom Johnson; Col Albert Sidney Johnston; Frank Jones; Sam Jones; William E. Judge; Bud Jordan; George W. Kendall; Pvt William Kimbrough; John King; W. A. Knox; Gen Lawton; Rev Roland Lay; Lydia Lea; Mary Curtis; F. H. Lehmann; John Linney; Geo Little; John A. Lomax; Jane Long; Bill Longley; Cale Longley; Cale Longley Sr; Campbell Longley; Will Longley; William Longley; William P. Longley; Mrs A. B. Looscan; Ed Lott; Edd Lott; Will Lott; Capt Jim Lucy; Pvt Mike Lynch; Prof John W. Mahan; Bill Malone; Black Malone; Pvt Henry Maltmore; J. A. Martin; lt Capt MiMast; Anton Mazzanovich; Craig McAda; John B. McDonnell; Archer McKinney; Caroline McKinney; Felix McKinney; Joe T. McKinney; Julius N. McKinney; Lucien McKinney; Mahaley Howard McKinney; Mary Pocahontas Cook; Rufus M. McKinney; Thalis McKinney; Thomas McKinney; Bill McKiver; Johnson McKowen; Capt W. G. McLennon; Gen McMlellan; Ben Milam; C. I. Mitchell; Joe Mitchell; Gen George W. Morgan; Paul Morgan; Babe Moye; Sgt Plunk Murray; Lt Nevill; A. M. Nichols; J. M. Nichols; Jim Nichols; Thomas Nichols; Frank Oneal; William Patterson; Dr L. W. Payne; Dr Robert Peebles; Buck Pettus; Eula Peyton; John Pope; Giles Maj Porter ; S. O.Porter ; Sam Porter; Z. C. Prina; Ben Pulliam; H. W. ("Zude") Pulliam; John Pulliam; M. B. Pulliam; Need Pulliam; M. M. Quaife; Father Querat; Lt Radiminski; Dr Charles W. Ramsdell; Fannie Ratchford; John Reagan; Dr W. S. Red; Paul Revere; Gen J. J. Reynolds; Starke; Vivian Richardson; Capt Roberts; Capt D. W. Roberts; N. H. Rose; Charles M. Russell; Dr Edward Sapir; Saunders; Dan Sawyer; Lew Sawyer; Capt Sedbury; Pvt Ed Seiker; Col Thomas Jefferson Shannon; John Shaw; Lam Sieker; Bruce Smith; Victor J. Smith; W. D. Smithers; Ike W. Sparks; Sam Sparks; Rev Father Spillard; Ed Steves; Charlie Stuart; Sgt Swilling; Charlie Taylor; Creed Taylor; Gen Terrazas; Prof Gates Thomas; George Thomas; Maj George H. Thomas; John Thomas; Thompson; Alec Thomson; Capt William G. Tobin; Wm B. Travis; Pvt Jim Trout; E. B. Judge Turner; Gen David Twiggs; George W. Judge Tyler; W. S. Veck; Queen Victoria; Chief Victorio; Miss Louise von Blittersdorf; Wallace; Buck Maj Walton; Gen George Washington; Martha Washington; Lark White; S. G. White; Mrs S. G. White; Dr G. D. Wilkerson; Andy Wilson; Pvt Andy Wilson; John Wilson; Eli Wixon; John Wood; Kate Woods; Gen Wool; Gen John E. Wool; Mrs A. C. Wright; Henry Yelvington; Adina de Zavala; Zarate-Salmeron.